Doulos Community is a Christian humanitarian organization, founded in 1984 in response to the great Sahel drought in northwest Africa. 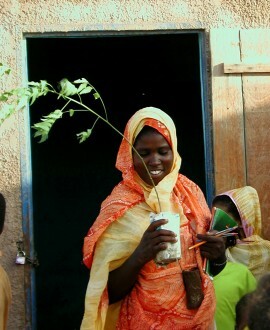 Doulos has made a special commitment to the Sahel and especially to Mauritania where we have been working since 1987. The word “doulos” is a term from the Greek New Testament (Philippians 2:5-8; Mark 10:42-45), used to describe Christ living on earth as a servant, having voluntarily surrendered privileges, comfort and status. Based on this concept, Doulos Community’s expatriate personnel maintain simple lifestyles in the communities where we work, and are committed to excellence in cultural sensitivity and mastery of local languages. All Doulos expatriates are volunteers, responsible for their own financial support. This practice contributes to Doulos’ ability to operate with low administrative costs, and allows Doulos to focus the vast majority of its resources on the needs of local communities. Doulos Community’s project activities place a priority on human development and providing the tools, skills and education that will permit individuals, families and communities to improve their situation. Training national staff members and providing technical assistance to local leaders and organizations are also key components of Doulos’ strategy, with the goal being to facilitate skill-transfer and the development of local management capacity. Doulos Community has its roots and headquarters in the USA, but it is truly an international organization, recruiting both expatriate volunteers and financial support from more than a dozen countries throughout Europe, Asia and Africa in addition to North America. Doulos was started by a group of friends: alumni and students from Princeton University, after the visit of one of their number to the countries of the Sahel in 1982. The visit highlighted the great need of these countries in general, and Mauritania in particular. In response to this, the group determined to explore together how they might address these needs, leading to the founding of Doulos Community as a US registered non-governmental organization in 1984. Doulos Community’s special interest in Mauritania stemmed from the fact that few international organizations were working in the country in the early 1980s. The needs were vast and there was clear potential for even a small NGO to make a difference. Doulos began program operations in Mauritania in 1987, focusing on the problem of child malnutrition and overseeing a large USAID-funded maternal and child health program that primarily operated in the slums and shantytowns of Nouakchott, Mauritania’s capital. Doulos continued to run this MCH program for 20 years until 2007, distributing 2,000+ metric tons of food aid annually to more than 20,000 mothers and children, and achieving excellent rehabilitation rates of malnourished children enrolled at its feeding centers. Beginning in the late 1990s, Doulos began expanding its activities both geographically into the south of Mauritania; and became more involved with community development activities. Located on the west coast of Africa where the Sahara desert meets the sea, Mauritania is often described as a bridge between the Arabic North and sub-Saharan West Africa. Its population of around 3.5 million people comprises the Arabic-speaking Moors with West-African tribes such as the Pulaar, Soninke and Wolof. Mauritania is an Islamic republic; observance of Sunni Islam is almost universal. Mauritania is dominated by the Sahara desert rendering 99.8% of the land unsuitable for crops. It is 161st out of 184 countries on the UN’s Human Development index and less than half the population is literate. A tenth of children die before the age of 5; GDP is about $1,070 per capita compared with $53,000 for those in the USA. Mauritanians were traditionally nomadic or semi-nomadic, herding their camels and cows between the oases and feeding grounds of the Sahel and the Western-Saharan desert. However droughts in the 1970s and 80s forced many to abandon this centuries-old way of life and settle into towns and cities. The droughts, economic migration and high birthrate saw the capital, Nouakchott, grow rapidly from a small fishing village in 1960 to a city of around 1 million people today – 1/3 of the Mauritanian population. Many in Nouakchott live in shantytowns and ghettos without proper health care, sanitation or water supply systems. The poor struggle to feed and educate their families in the face of high unemployment (31%) and divorce. The rural south is more fertile but is isolated and struggles with malaria, malnutrition, and inadequate education and health coverage. Southern farmers typically live on subsistence agriculture of millet and cowpeas. One of the key challenges faced by Mauritania is the need to strengthen education and training to prepare people for successful careers and businesses, and provide solid technical skills and vocational training. In a 2013 report produced by the World Economic Forum (WEF), Mauritania ranked 121st out of 122 countries in terms of its human capital development. According the WEF, a nation’s “human capital consists of the skills and capacities which exist in a country’s population, and it is the single-most important factor in guaranteeing long-term economic success of a country.” Doulos Community’s programs and activities are now focused almost entirely on addressing the need to strengthen human capital through training and leadership development.